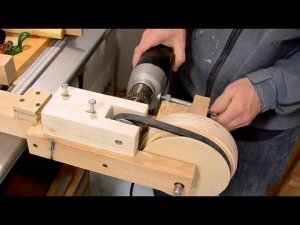 Matthias Wandel, of woodgears.ca once again proves that he can build pretty much anything out of wood and other scraps he has lying around his shop. In previous videos he built himself a wooden scaffold to reach the lights that needed to be changed in his large shop. In his latest video he uses more scrap wood and a drill to motorize his scaffold, complete with forward, reverse, and steering. The results are more impressive than you might have thought.